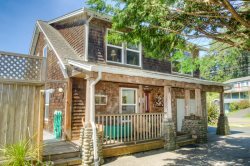 Lily Grove is a quaint Manzanita beach home steps to the beach. Lots of windows and a welcoming front door. Cozy living room with seating for 6. Large flat screen TV with cable. Hot and cold outdoor shower. Makes it easy to wash off after a beach adventure. Another view of the living room. The couch does fold out for additional sleeping if needed. The comfortable furniture will keep you coming back again and again Downstairs oversized bathroom, is wheelchair accessible and attached to main level bathroom. Washer/Dryer, includes fragrance free laundry soap and dryer sheets. Main level large queen bedroom with bathroom attached. Bedroom is spacious and wheelchair accessible. Plenty of natural light with a skylight has cover and windows has curtains Great little table on main floor bedroom to use for reading, puzzles, games, etc. Cozy kitchen with room at the table for 5. You could add another chair if needed. Well stocked kitchen with everything you need for a great family meal. Including dishwasher. Kitchen/dining area is surrounded by windows and a door that leads outside to the spacious patio. Patio takes you out to the back deck where you can BBQ and hang out with the family and bask in the sun. Upstairs you will find a large queen bedroom with a small desk. Another view of the blue bedroom shows the private deck with good peak of ocean. Great way to get that fresh ocean breeze during the day. Ocean peak from upstairs private deck off the bedroom. Fenced front yard. Great place for the kids and dog to play. Upstairs full bathroom Upstairs bathroom with shower and tub. 3rd queen bedroom which is upstairs. Spacious, light and bright. Another view of queen bedroom. Bedroom has a desk for working if needed or a great place to sit and read. View of the back deck looking at the french doors into the kitchen. Great place to spend with family. Great backyard space. Cozy sunning seats. Beach toys in a chest by front door. View of front yard area. View of shed in backyard with beautiful greenery. Not for renters use. Backyard path which leads around to the front yard. Beautiful greenery. Lily Grove is situated a block from downtown Manzanita, and steps to the beach. This little home boasts three bedrooms and two bathrooms. On the main level there is the living room, one queen bedroom, a full bathroom, and kitchen/dining area. Upstairs there are two spacious bedrooms that share a full bathroom with tub and shower. Both bedrooms upstairs have queen beds and plenty of windows which give a light and bright feel. One of the rooms has a small private deck with a good peak of the ocean. The kitchen is spacious and very well stocked with everything you need to make a tasty meal for the family. The French doors off the kitchen lead to a wonderful deck with great sun exposure. The yard is fenced and private with a small bistro table and chairs. Lily Grove will become a fast favorite and something you will want to return to again and again! We allow one dog and provide dog towels, sheets and a bowl. This lovely home is perfect for six adults or two small families. Beach toys and some games will keep the little ones entertained for hours. We look forward to seeing you in Manzanita!!! 1 dog, at least two years of age, welcome. Must be flea treated. blender, food processor, crock pot, etc.